Pure and natural beeswax blended with unexpected honey fragrances for a sensory experience beyond what nature intended. Crafted by America's first family of beekeeping, honey, all-natural beeswax, and the highest quality candles. 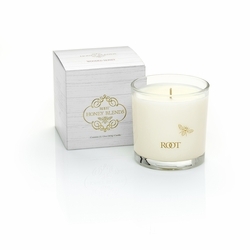 Root Candles supports the beekeeping community.�Proceeds from the sale of this candle benefit Project Apis m. Project Apis m.'s mission is to fund and direct research to enhance the health and vitality of honey bee colonies while improving crop production. Bees that pollinate around fresh water lakes and streams seem to deliver a fresh, green flavor from their time around lilies, water roses and tonka wood. This effervescent blend is clean, fresh and sweet. This is the lightest, most delicate and sought after of all honey blends. Bees love the Basswod tree-attracting honey bees from all around. Delicate woodsly notes and a milk flavor result in a luxurious fragrance blend.